(Held by the old boss). Finally got some pictures of the Wee Bairn burned from memory stick to CD, and appropriately enough, the best one of him is when he's being held by his momma. Allow me to introduce you all to my son. Now, Anchorman was, IMHO, a lame movie. But I was inspired to borrow from Ron Burgundy's introduction to the movie video found on the DVD. Chay Baron B. was born last night, Thursday, January 27 at 9:26 PM PST. 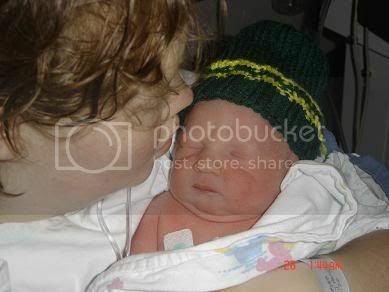 The Wee Bairn weighed in at 6 pounds, 9.5 ounces, and measured 18.5 inches. He's breathing on his own, his heart rate and O2 sat are good. Mom is sore but happy. Oh, and he's a damn fine looking kid, thank you for asking. My deepest thanks to everyone who has prayed for TFR and TWB over the past week. Your prayers were felt and, obviously, heard. Please continue to pray for his continued development and mom's recovery. No details for her privacy, but suffice it to say it was a long, difficult labor.